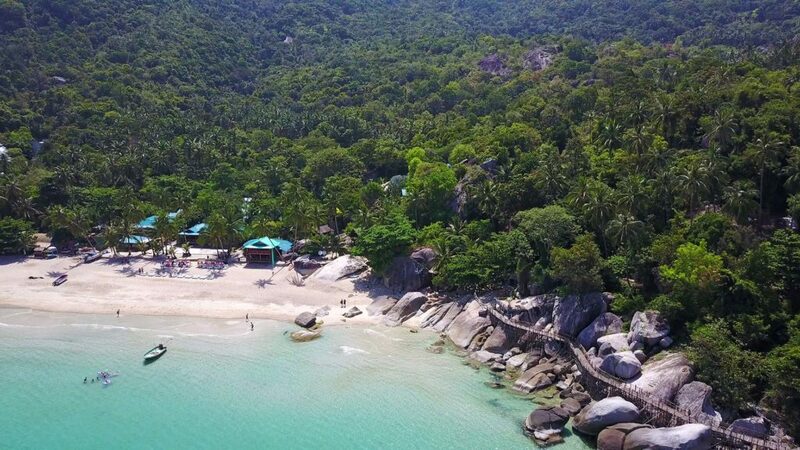 The Haad Yuan is situated about 3 kilometers north of the famous Haad Rin Full Moon Beach at the east coast of Koh Phangan. 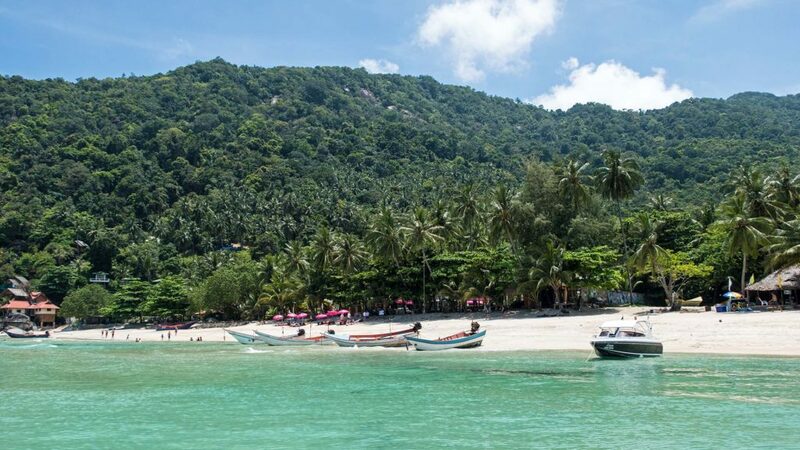 As the beach is not so easy to reach, you will find – compared to other beaches on Koh Phangan – just a few visitors. You can only get there by boat e.g. 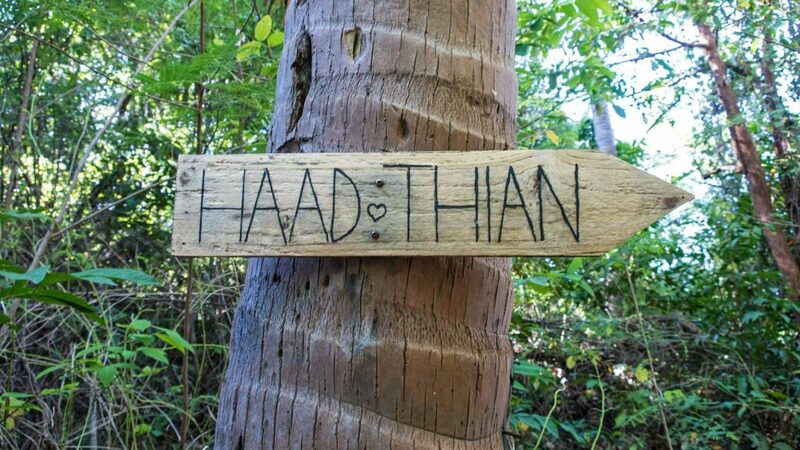 from Haad Rin Beach or you can hike about 2 hours from Haad Rin town through the jungle on the east coast. 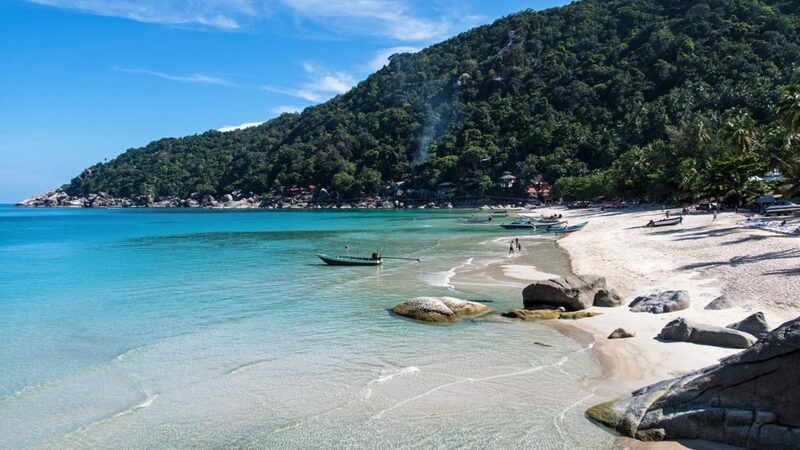 The trip to the beach is definitely worthwhile since the Haad Yuan is one of the most beautiful beaches of Koh Phangan! The Haad Yuan is especially known for its Eden Garden Party, which takes place every Saturday and where people party until the early morning. 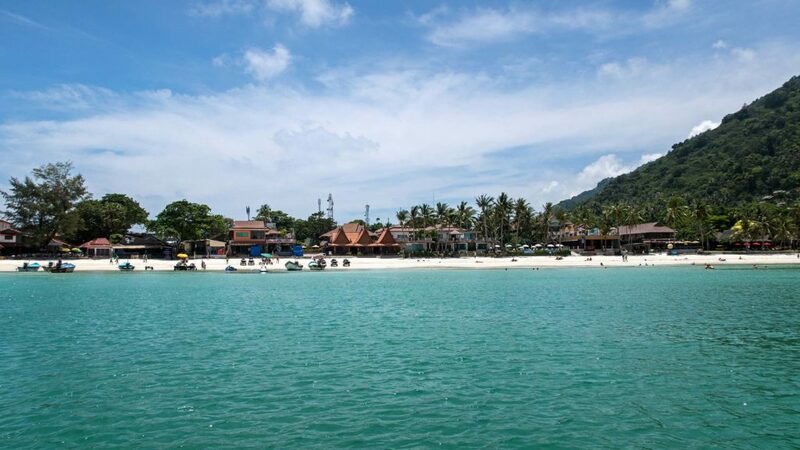 There are many people who just visit Haad Yuan for this very party as there are only few accommodations at the beach. Hence, the choice is not so large. 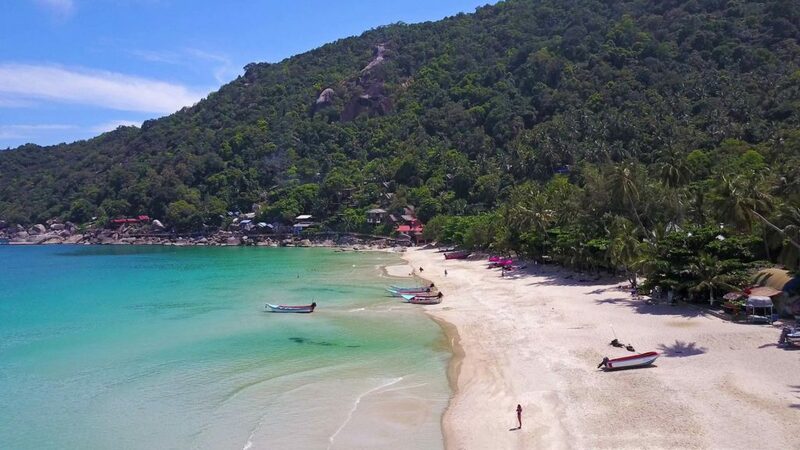 You can always find a longtail boat at Haad Rin Beach waiting for customers to take them to the east coast of the island, which is actually pretty hard to reach if you go overland. 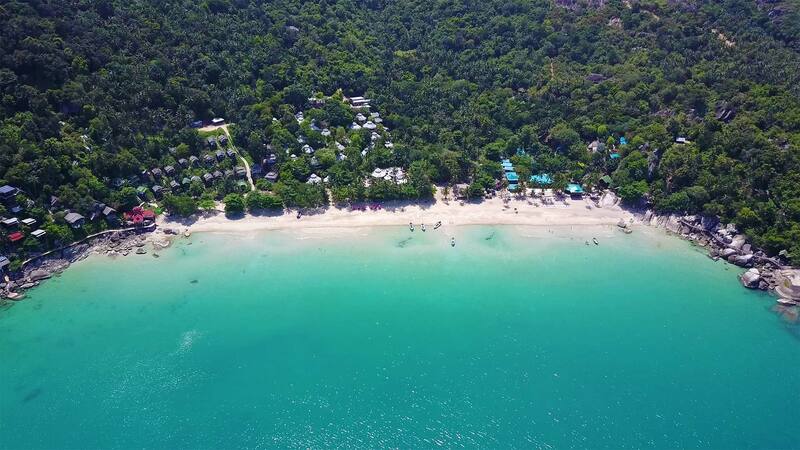 Depending on the season and demand, prices vary slightly between 200 and 300 baht per person one way. During the boat ride you will see a lot of motifs for nice pictures like Haad Rin itself, the Haad Khontee or the rock formations right before arriving at Haad Yuan. By the way, most of the boats don’t have any sun protection, so be sure to not forget some sunblocker and cover your head properly. The view upon arrival at Haad Yuan is really nice: Beautiful turquoise water in which I wanted to jump immediately and a fine white sand beach, which is not crowded at all. The first impression was more than good. The first thing we did after arriving at Haad Yuan was looking for a comfortable shady spot. 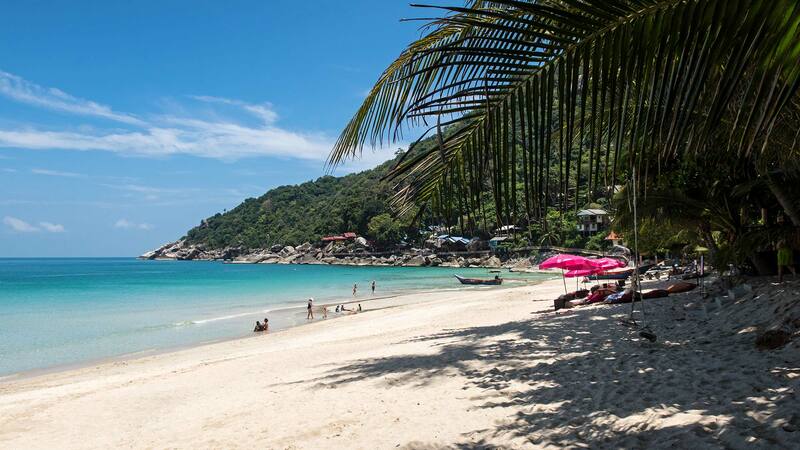 You will also find a few sunbeds and umbrellas in front of some resorts along the beach, if you prefer that. But you have to order at least a drink at the hotel bar to use them. 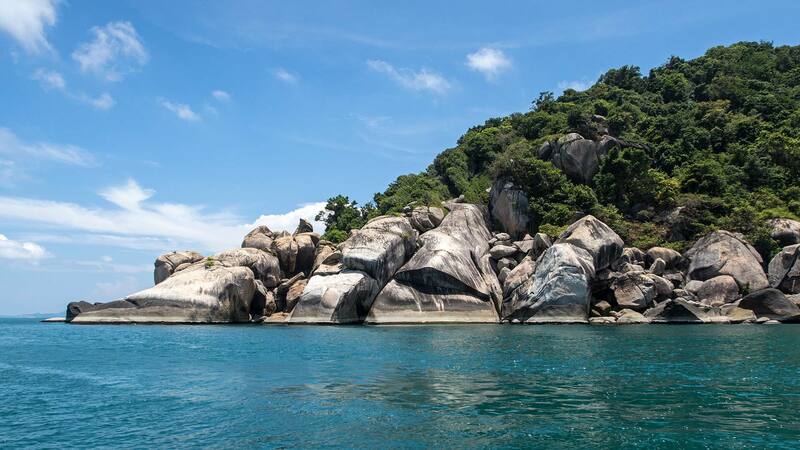 The quiet bay of Haad Yuan is ideal for paradise-like pictures and the water is really suitable for a good swim. It gets deep pretty fast, so you can swim properly and on top of that, the water is so unbelievably clear. Furthermore, there are no stones whatsoever and the underground is soft everywhere. Absolutely fantastic. 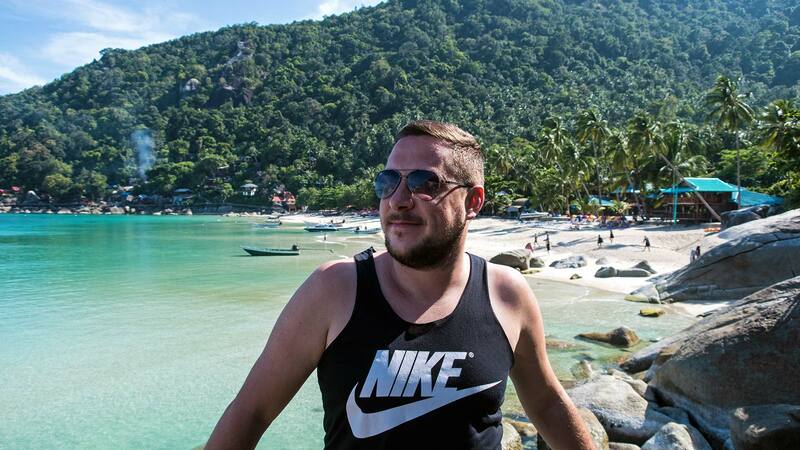 The trip to the remote beach of Koh Phangan has paid off already. 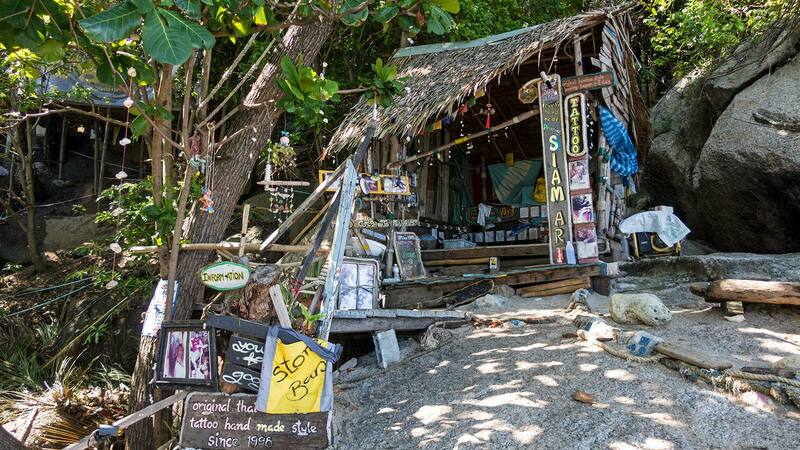 There are also a few bars and restaurants at Haad Yuan or on the rocks at the northern end of the beach if you get hungry or thirsty. A new highlight for us is our DJI Mavic since the end of last year. A small drone and our latest toy to make some wonderful shots from the air. There is actually not much to tell – pictures say much more than words. 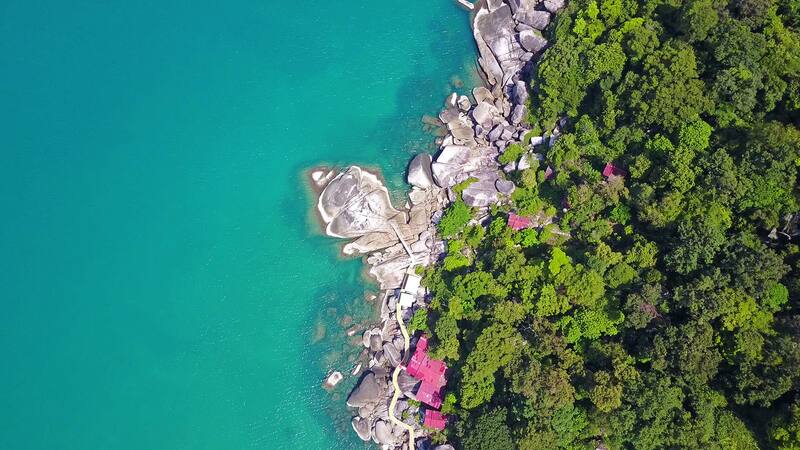 If you are curious how other places on Koh Phangan might look from above, check out our first Koh Phangan drone video. 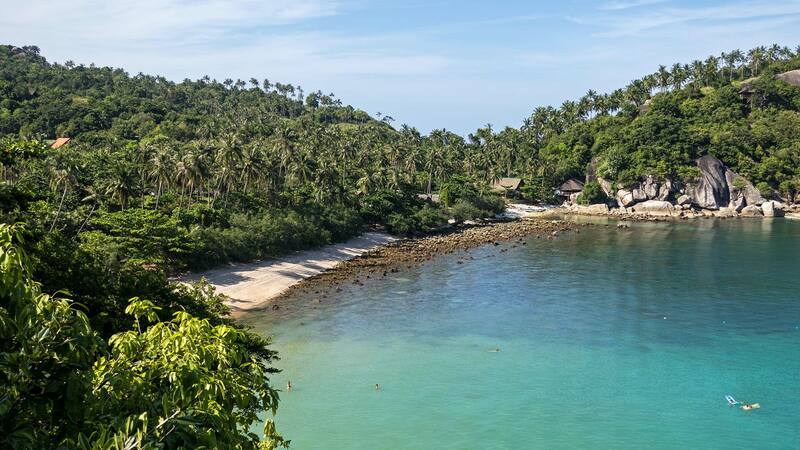 If you visit Haad Yuan, you can also combine it with a visit to the next bay – the Haad Thian Beach. Those two beaches are connected by a short walk of 10 minutes. Tip: You can tell your boat driver to pick you up at the Haad Thian instead of the Haad Yuan, where he dropped you off. That’s what we did. 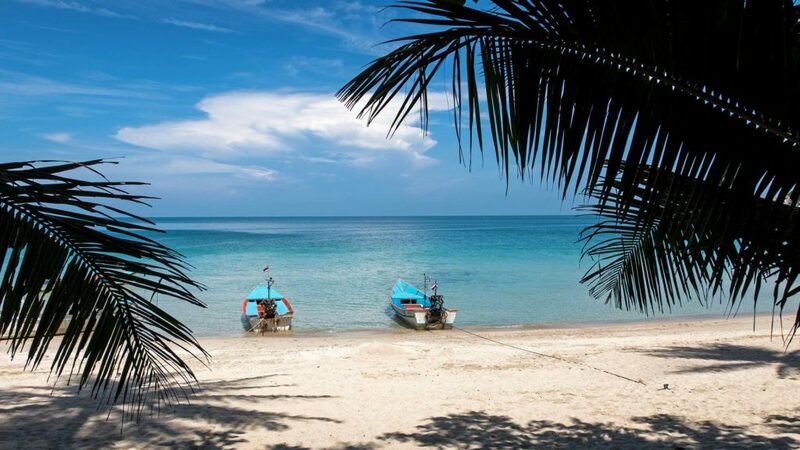 They drop you off without any problems at one beach and pick you up at the next bay for the same price. The way is really easy to find. 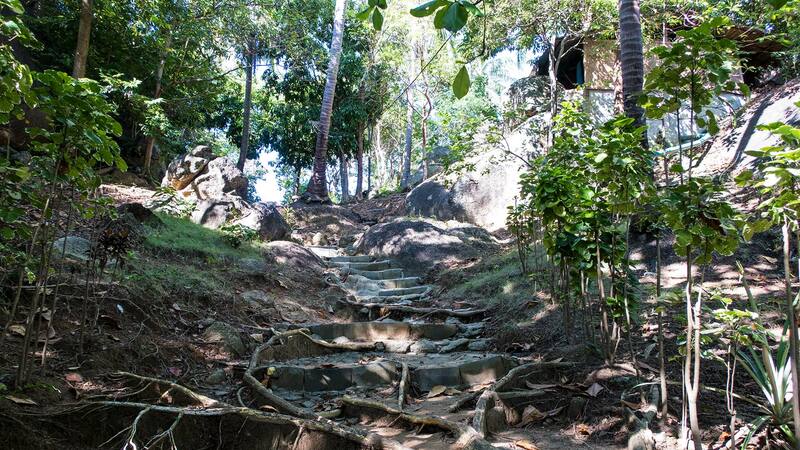 You just have to walk to the northern end of the Haad Yuan and follow the wooden path on the rocks to the Eden Garden Bar, until you reach a staircase made of stone. On the way you will have some nice views at Haad Yuan and a couple of great photo motifs. 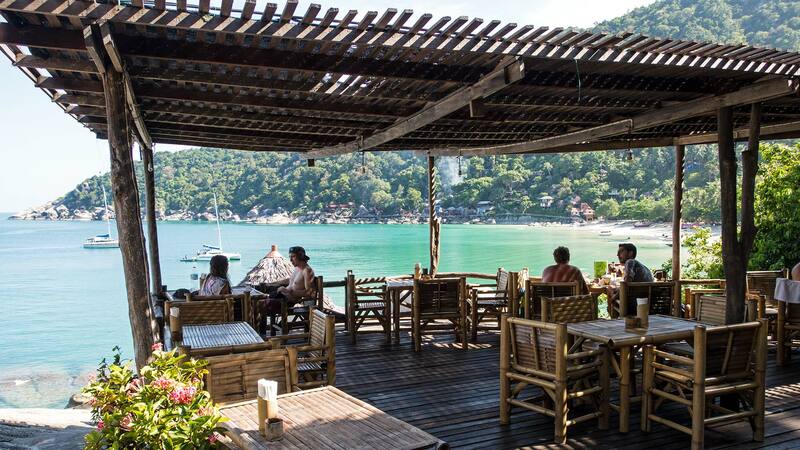 The restaurant of the Bamboo Huts also offers a terrific view and if you are hungry, it’s the perfect spot to enjoy some food with a view. We just bought some cool drinks and kept on walking the short distance passing some of the bungalows to Haad Thian. There are some signs on the way so you won’t get lost. You should find the way over the hills without any problems. From above you can enjoy the great view over the Haad Thian, which is partly rocky. The Haad Thian itself isn’t quite as beautiful as the Haad Yuan. The sand is somewhat rocky and at least during low tide there is only a small area left to swim, which is unfortunately often occupied by parking boats. The atmosphere of the Haad Thian is otherwise very relaxed, mostly because of The Sanctuary Thailand. A resort to do a lot of yoga, detox or other healing programs in this very secluded bay. A day trip to Haad Yuan is definitely worth it. The beach is really beautiful and absolutely perfect for a swim. The Haad Thian, on the other hand, is just worth a short visit. 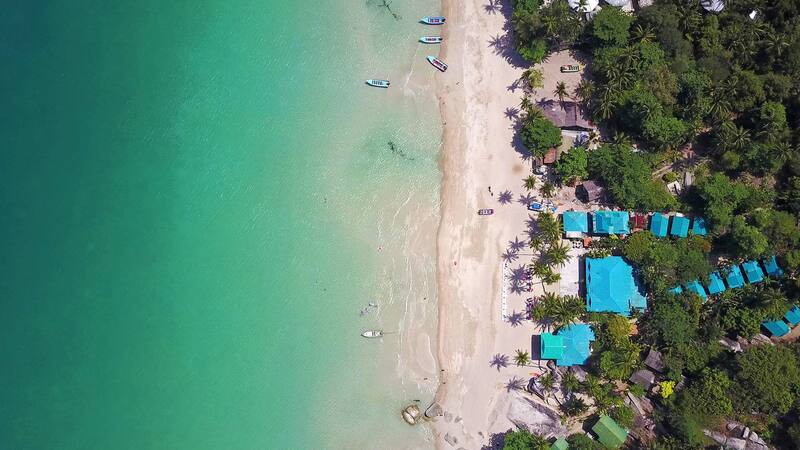 You can visit the beach, but it’s not a must. We actually prefer the Haad Yuan. 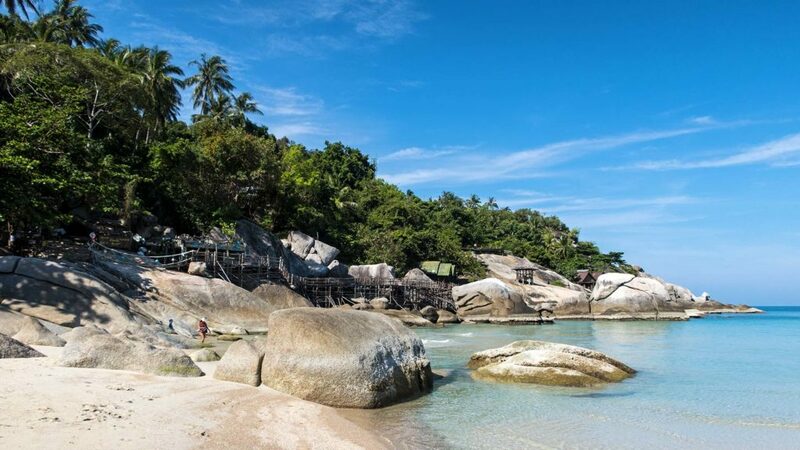 If you want to visit the Eden Garden Party on Koh Phangan, you can combine it with a day trip to the beach. Highly recommended! Have you been to Haad Yuan or Haad Thian yet? Did you like it? Leave us your opinion in the comment section below.